Why Does the Book of Mormon Say We Must Worship God with Our Whole Soul? View this article at bookofmormoncentral.org. In 2 Nephi 25:29 we learn that we must worship Christ with all our “might, mind, and strength” and our “whole soul.” The phrase “whole soul” appears seven times in the Book of Mormon and seems to be an important concept in the text. At first, it is hard to know exactly what this phrase might mean. However, when read in light of the Old Testament, this phrase teaches us about dedicating ourselves to God. One way to understand how we can to give our “whole souls” to God comes from Omni 1:26. This verse encourages all people to come unto Christ and offer their “whole souls as an offering unto him.” This is similar to an ancient Jewish text which states that when someone gave a grain offering, God would “account it as though he had offered his own soul to Me”. This invokes the image of giving ourselves to God as though we were putting ourselves on the altar and consecrating ourselves to Him. This connection is strengthened by other uses of the phrase whole soul in the Book of Mormon. Enos 1:9 and Mosiah 26:14 state that people poured out their whole souls to God. As used in the Book of Mormon, this refers to a person praying fervently to God. However, it can be understood in another way as well. The idea of a person pouring out their whole soul makes sense when understood in light of the grain offering. 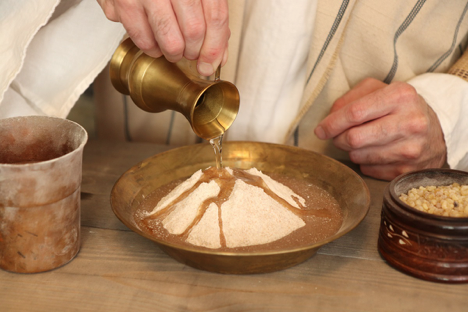 As an essential part of this offering, the worshipper had to “pour” oil onto the pile of flour (Leviticus 2:2). Thus, a person pouring out their soul to God fits with the imagery of the grain offering. There is another sacrifice in the Law of Moses that helps to explain the idea of offering your whole soul to God. Leviticus 1 describes a sacrifice that the King James Translation calls a “burnt offering,” but which can also be translated as a “whole offering.” This is because the priest would offer up the entire animal as a burnt offering, rather than saving some of the meat as food, as they were sometimes required to do. The command in Omni 1:26 to “offer your whole souls as an offering” to God may connect to this type of burnt offering. Just as the whole animal was offered, we are to offer our “whole souls” to God. This interpretation is supported by Words of Mormon 1:18, which states that, “king Benjamin, by laboring with all the might of his body and the faculty of his whole soul, and also the prophets, did once more establish peace in the land.” This verse states that King Benjamin worked with all his might and his whole soul in order to bring peace. As in 2 Nephi 25:29, working with all your might is part of worshipping with all your might and dedicating you whole soul to the work of God. God commands us to dedicate our “whole souls” to Him because He is willing to do the same for us. In Jeremiah 32:41 God states, “I will rejoice over them to do them good, and I will plant them in this land assuredly with my whole heart and with my whole soul.” We are asked to symbolically put ourselves on the altar and offer ourselves to God, but Christ literally “offereth himself a sacrifice for sin” (2 Nephi 2:7) for all of us through his atoning death. In His life, He gave all the faculties of His “might, mind, and strength” for us, and dedicated the energies of His “whole soul” to other people and to God. May we all give of ourselves, “fully and unreservedly” and offer our “whole souls” as an offering to God, remembering that He has offered Himself for us. Daniel C. Peterson, “Elder Neal A. Maxwell on Consecration, Scholarship, and the Defense of the Kingdom,” Interpreter: A Journal of Mormon Scripture 7 (2013): vii–xix. Neal A. Maxwell, “Discipleship and Scholarship,” BYU Studies 32, no. 3 (1992): 5–9. Gary R. Whiting, “The Testimony of Amaleki,” in Jacob Through Words of Mormon, To Learn With Joy, Book of Mormon Symposium Series, Volume 4, ed. Monte S. Nyman and Charles D. Tate (Provo, UT: Religious Studies Center, Brigham Young University, 1990), 299–301. See 2 Nephi 25:29; Enos 1:9; Omni 1:26; Words of Mormon 1:18; Mosiah 2:20–21; 26:14. See b. Menah 104b, referred to in Jacob Milgrom, Leviticus 1 –16: A New Translation with Introduction and Commentary, Anchor Bible Commentary, Volume 3 (New York, NY: Doubleday, 1991), 179. Book of Mormon Central, “How the Law of Moses Teaches about the Atonement (Alma 34:14),” KnoWhy 424 (April 12, 2018). Journal of Discourses 2:123 (1853). Daniel C. Peterson, “Elder Neal A. Maxwell on Consecration, Scholarship, and the Defense of the Kingdom,” Interpreter: A Journal of Mormon Scripture 7 (2013): xv. This article was published in abridged form in Neal A. Maxwell, “Discipleship and Scholarship,” BYU Studies 32, no. 3 (1992): 5–9.